Smoked Halibut using Alder Wood, is a Northwest Favorite. Smoked Halibut is prized for its sweet flavor and snow white flaky texture, it makes excellent table fare. Smoking Halibut is a great way to enjoy this delicacy if given the proper attention. 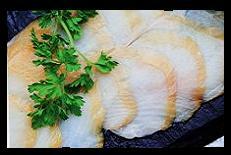 Do to the low fat and oil content of halibut, the brining time and the amount of time in the smoker should be reduced to prevent it from drying out. A basic brine recipe of 1 cup salt, 1 cup sugar, dissolved in 1 gallon water will work. Although this recipe works fine, I like to double the amount of sugar to make a sweeter brine, as this compliments the natural sweetness of this fish. After no more than two hours in the brine, remove the fish, rinse with cold water and pat dry. Then arrange the fish on a rack and let it air dry until it becomes slightly tacky. Now The Smoker … Start with the temperature at 120 degrees for the first hour of cooking time. Then raise the temperature to 180 degrees in several stages over the next hour. If you struggle with math, it adds up to two hours so far. I like my smoked fish on the moist side, so after one more hour at 180 degrees, start checking for desired doneness. If it is not done give it another hour at 180 degrees, that usually does the trick. Remember this procedure is tailored to fit my taste. Everyone is different, so do not be afraid to change the brine or cooking time to find the right flavor and doneness that suites you. Smoked fish for everyone ... lets get smoky!